Confession… I was all ready to share our updated patio with you today until… I realized I wasn’t scheduled to post about it until NEXT week. 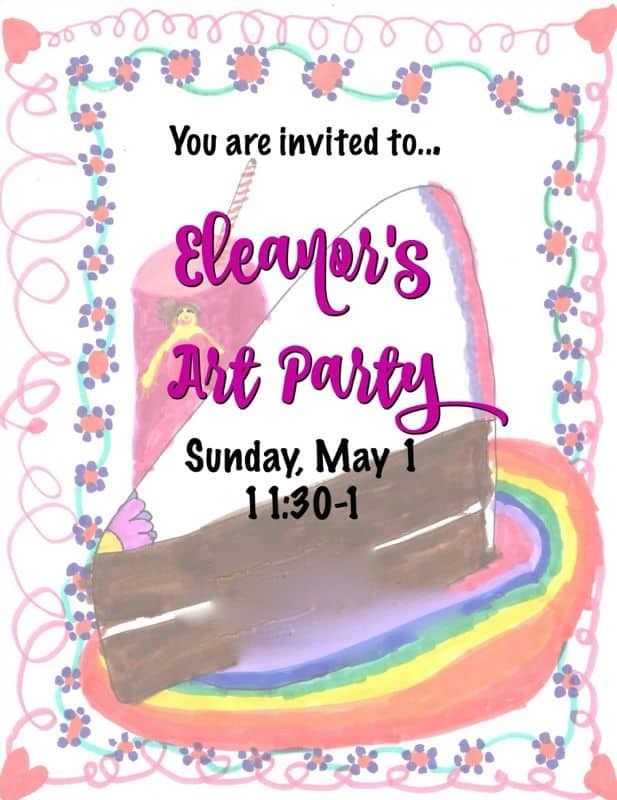 Good thing I have lots of fun things I’ve promised to share like Eleanor’s cute arts and crafts birthday party! 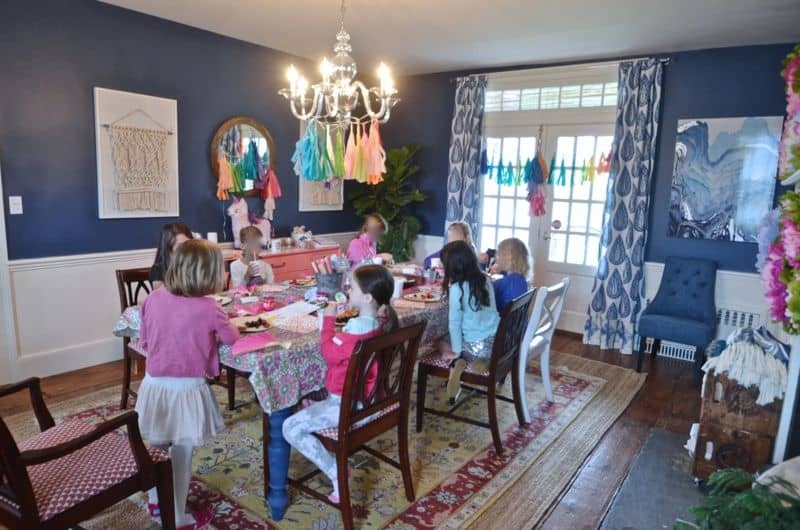 She wanted to invite a group of girls over to the house and have an Arts and Crafts party. 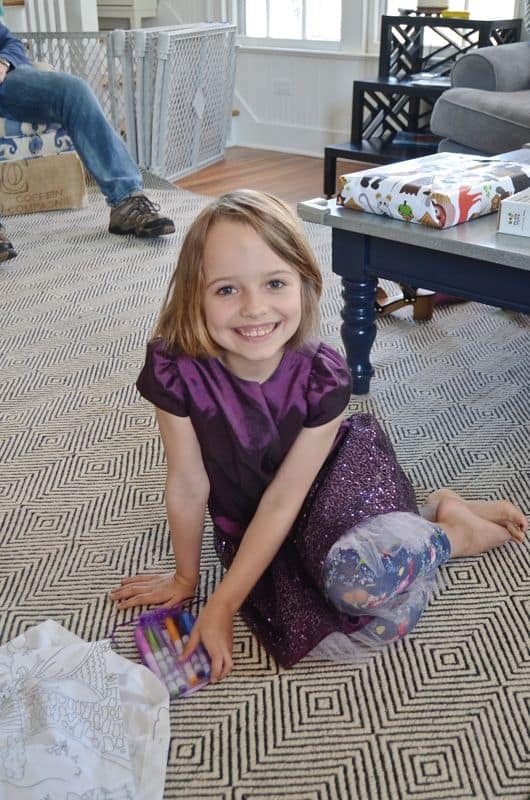 With five small children, my one goal as a parent is to instill in them kindness and joy for each other. 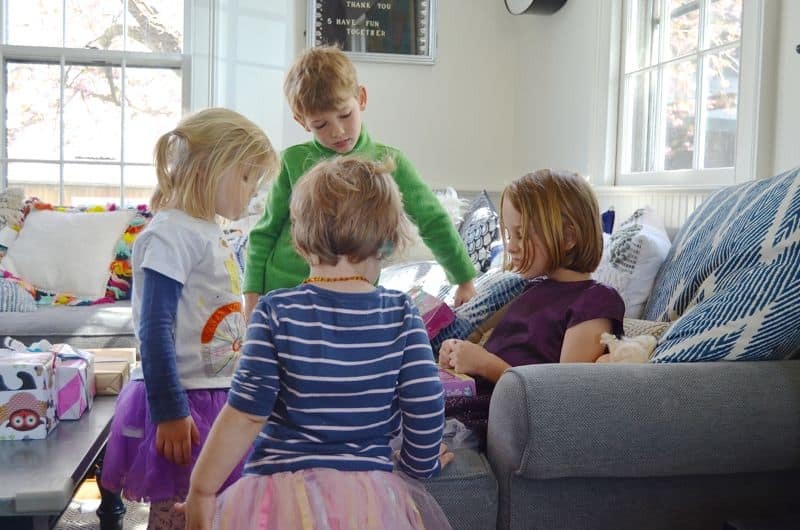 I love this picture of the younger kids eagerly watching their big sis opening her family presents. There’s one thing you should know about Eleanor. She LOVES herself a party. 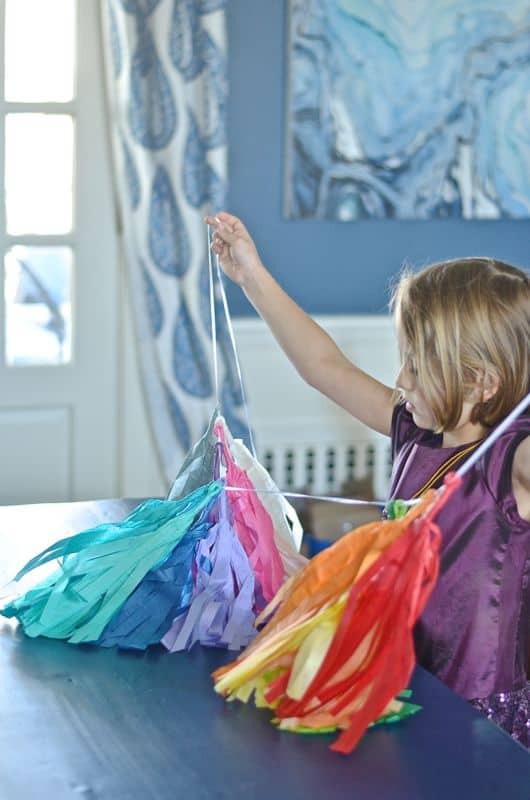 Like her mama, the decorating and the planning and the crafting is right in her wheelhouse. 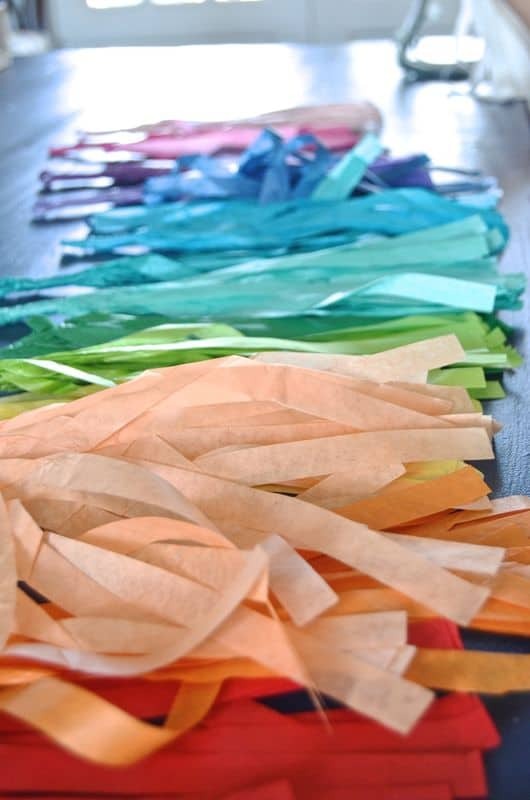 I ordered these rainbow tissue tassels and Eleanor helped put them together. 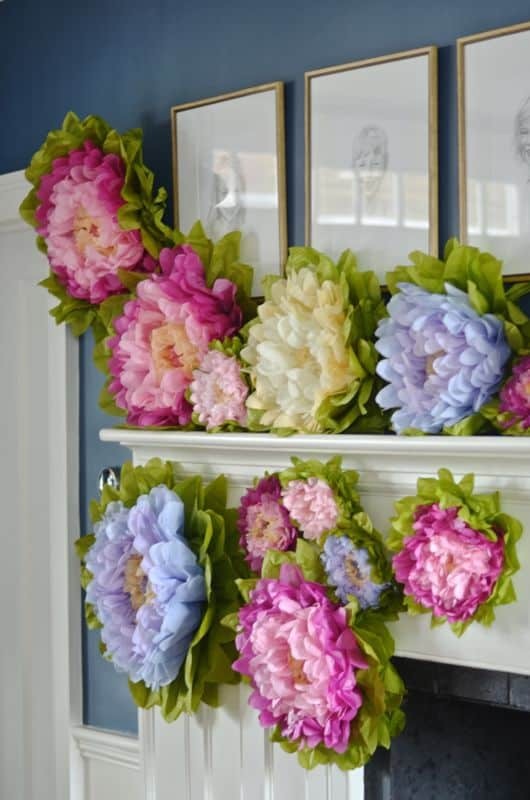 The other show stopper were these tissue paper flowers. 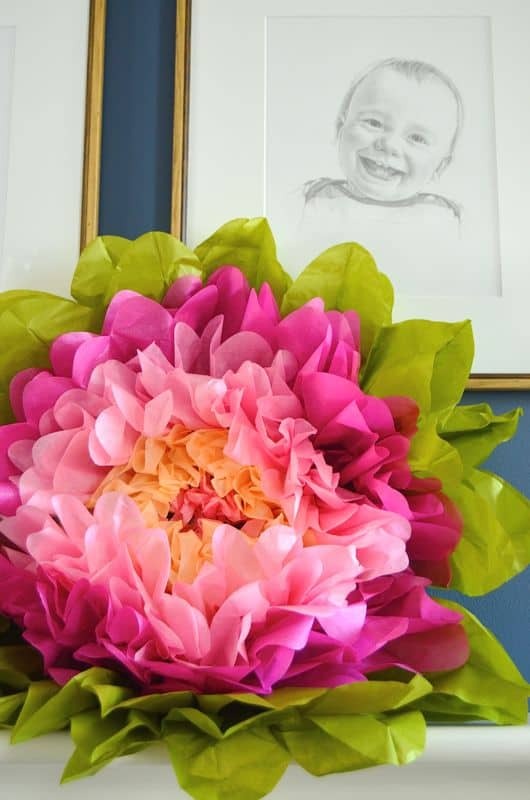 Fair warning, they come folded up and you will have to do the ‘fluffing’ but… they are AMAZING. The giant ones are full and gorgeous. 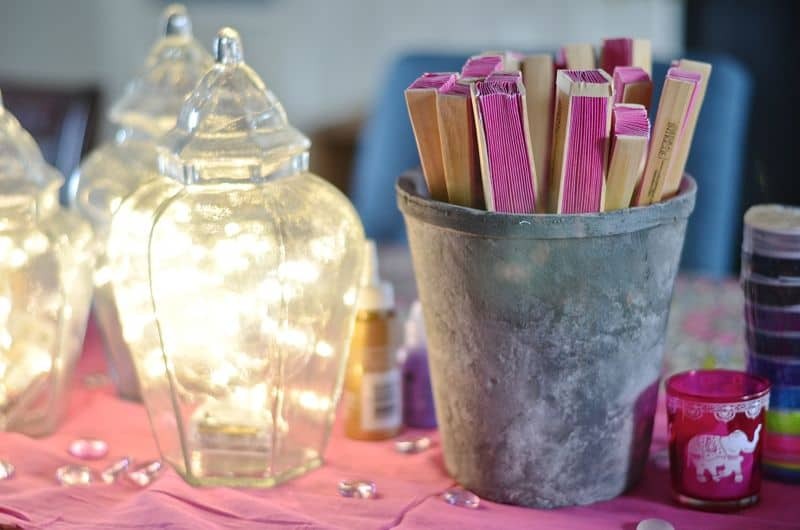 It was raining the day of our party, but I was planning to have them scattered along the tree trunks and I considered stapling some onto dowels to have dotted around our garden. But, because of the rain, we just used command strips to cover the mantel with them. 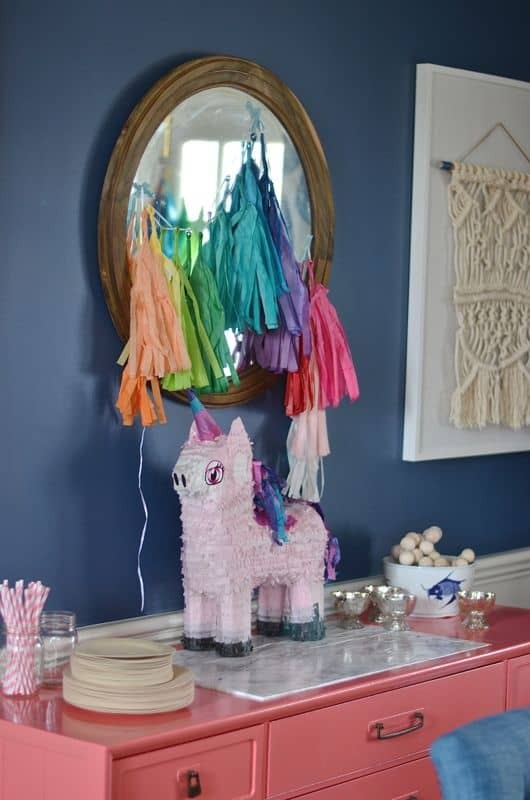 She insisted on a pinata. We found this one on Amazon and she was talking about it for weeks! 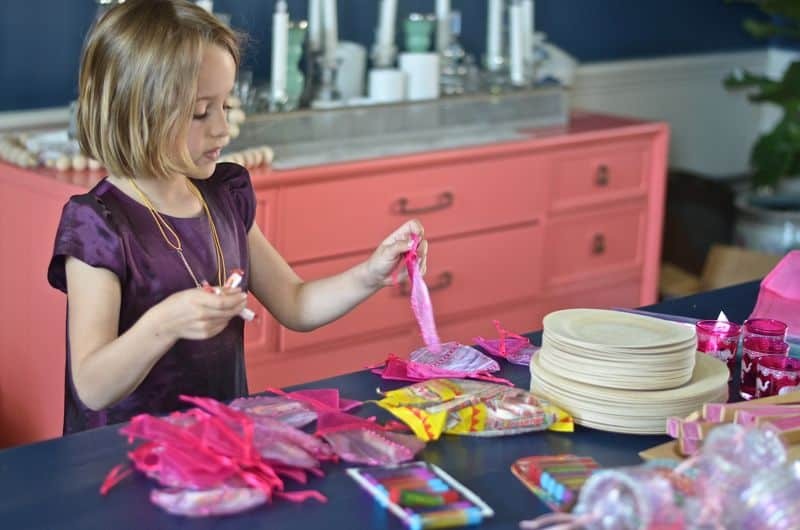 Any good party in the elementary school circuit needs a goodie bag… Fuchsia became the default theme for the party, so she was immediately enamored with these sweet little cloth bags… they were JUST the right size to stick a few pieces of candy, chapstick, some post-it notes, and a light up ring. Oh… and fans. We’ve been reading lots of Fancy Nancy so the fans were an important detail. 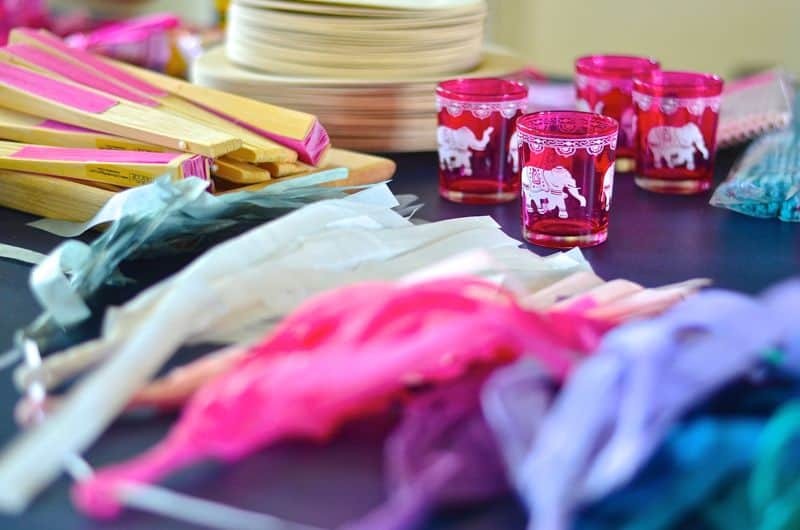 She also saw some fuchsia votives and made a strong case for those as well! 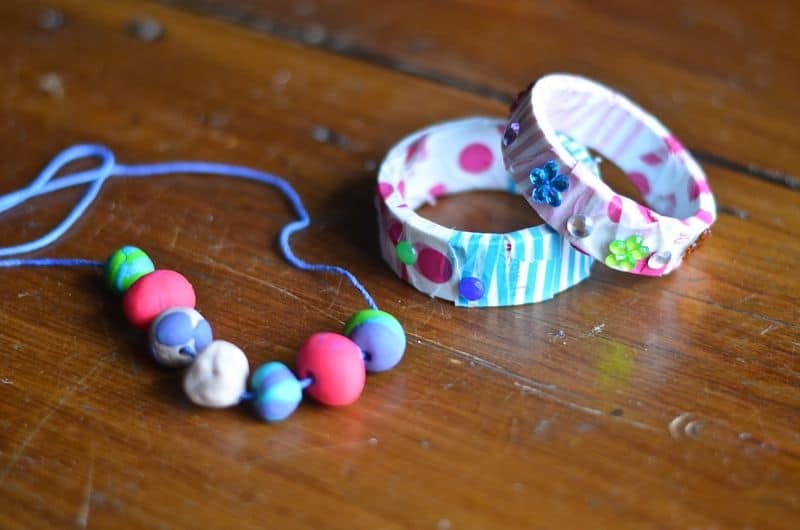 For her art projects, I invited Eleanor to scroll through Pinterest with me one day and these were the two crafts we came up with: DIY beaded necklaces with oven-baked clay and DIY bangle bracelets made out of PVC pipe! 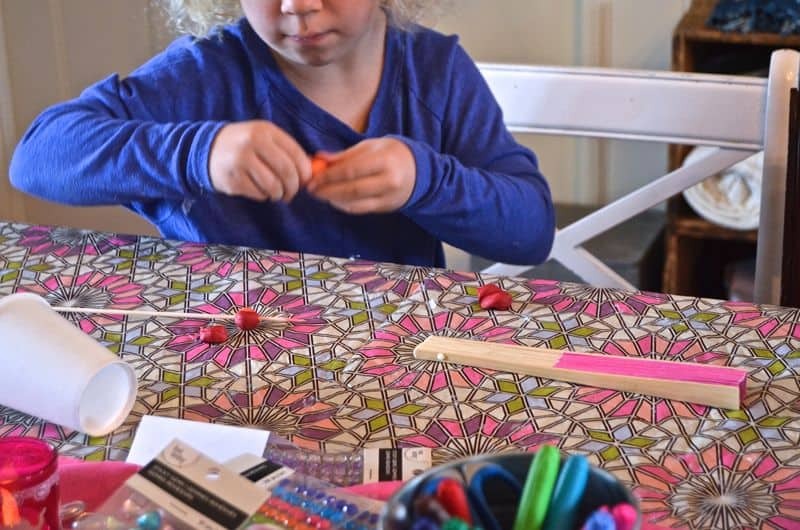 The necklaces were SUPER easy and I highly recommend… I had a multi colored pack of Sculpey and all the girls made beads the size of cherries and poked a bamboo skewer through them. While they were making the bracelets, I baked the beads, and all they had to do was string them onto a cord of their color choice! 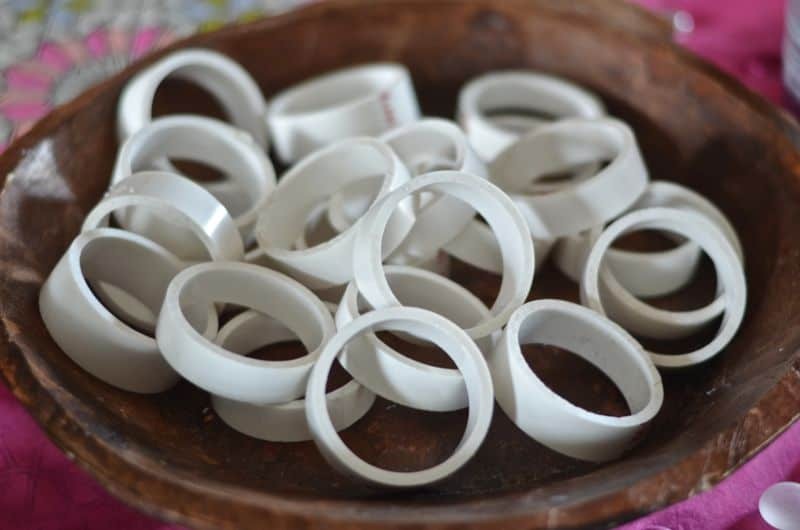 For the bracelets… we grabbed a length of PVC pipe at Home Depot for maybe $4? I made sure Eleanor’s hand fit through it obviously, and then I used my miter saw to cut the pipe into smaller slices. 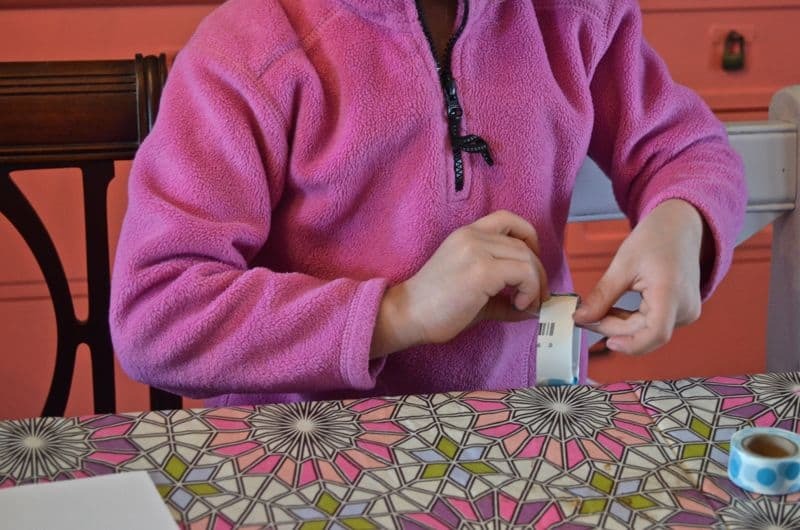 The girls wrapped different colored washi tape around the PVC pipe to create their bracelets. Other details? 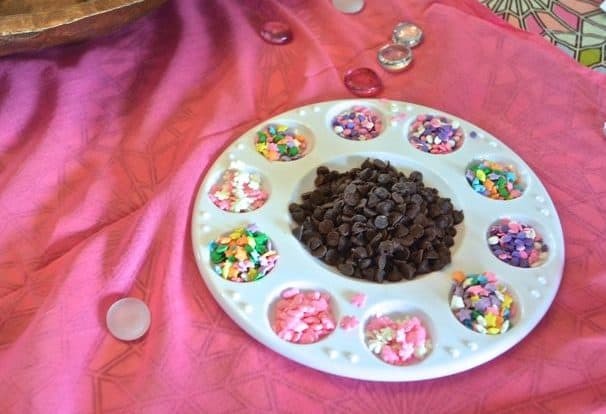 Eleanor’s #1 request is always an ice cream cake, so we thought it would be fun to have some extra toppings served to everyone in a painting tray. 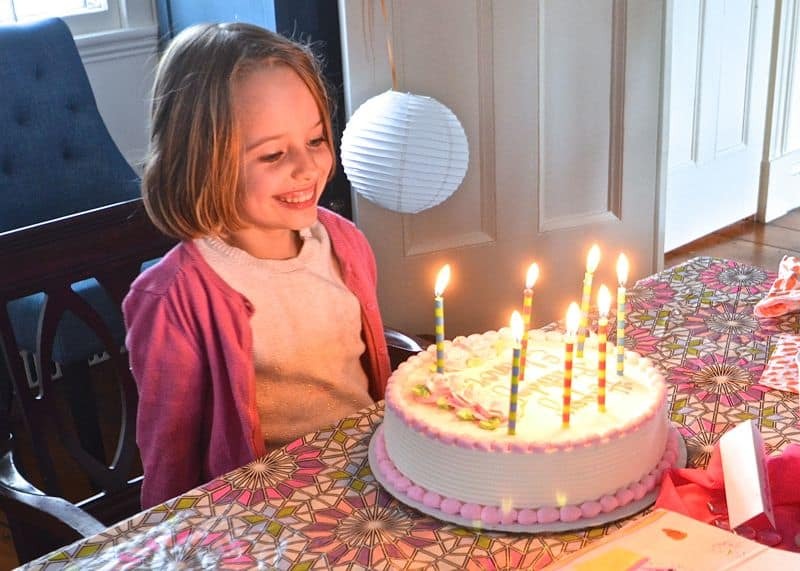 Aside from the dreary weather, this party was an adorable 7th birthday celebration! 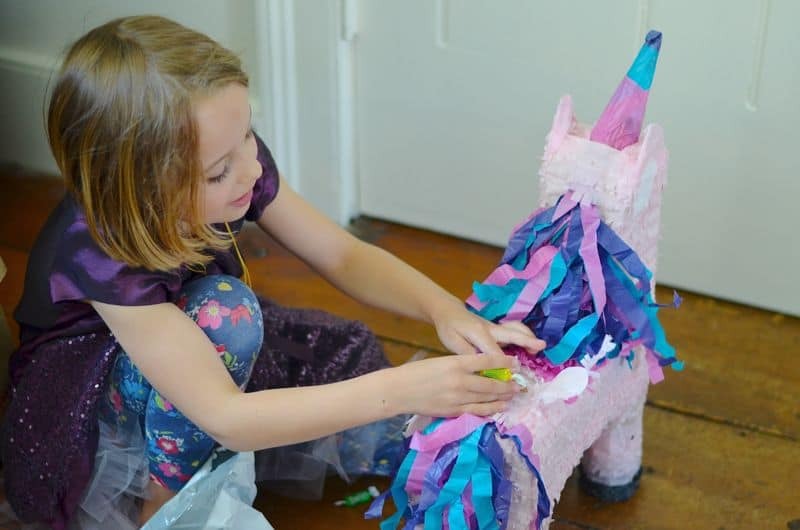 The girls had a great time making their own jewelry and Eleanor was delighted to have all the fuchsia and rainbows and unicorn merriment for her big day! Adorable! So many great ideas here. I noticed while going to the Fan link that it says it’s 5 pieces. Does that mean 5 fans? I wasn’t sure.